There's been played a heck of a lot of games this weekend, and we have naturally done our bit to watch them all. We have done that, so we can bring you the very best boot spots, and if we may say so ourselves, we have succeeded. The main theme for the weekend has got to be brand betrayal, as many of the biggest stars, this round flirted with different brands. 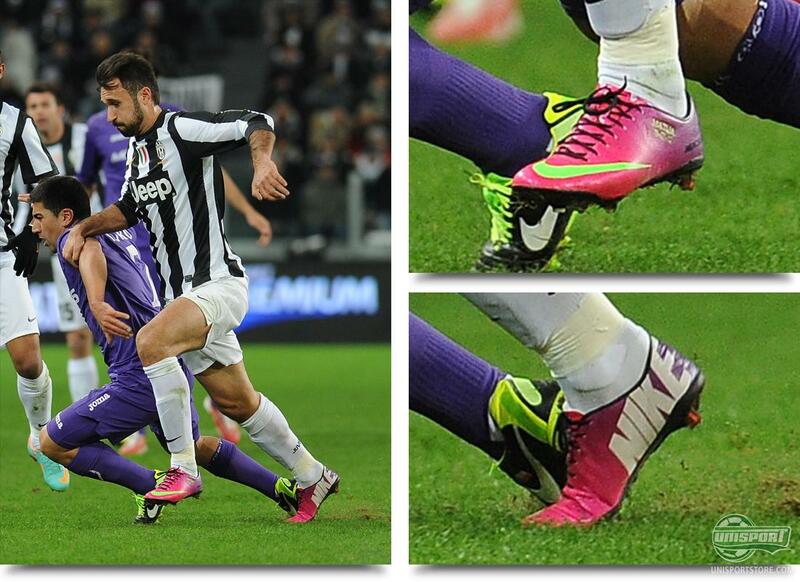 Mirko Vucinic (Juventus)  Nike Mercurial Vapor IX ACC Fireberry/Electric Green/Red Plum At home in Turin, La Vecchia Signora (The Old Lady) took on La Viola, and that would prove to be a fairly simple task, for the reigning champions. The gentleman above scored the first of Juventus' two goals, and he did so in a pair of Nike Mercurial Vapor IX ACC Fireberry/Electric Green/Red Plum. It was pretty surprising from a man, who has for many years, been a avid user of Nikes Tiempo-collection. Only last week did he play in a pair of Legend IV Black/Electric Green, but we have to say, that we condone the change. McDonald Mariga (Parma)  Puma V1.11 SL Green/Black Easily the coolest name of the week, can also boast a pair of super cool boots. It is one of our WebTV host Jakobs personal favourites, when it comes to speed boots: Puma v1.11 SL Green/Black. It is the ultra light version of the v1.11, and it is interesting, that it didn't get much support from the professionals, but this has not stopped Mariga from grabbing a pair. Francesco Pisano (Cagliari)  Nike Mercurial Vapor IX ACC Metallic Platinum//Black/Electric Green When the Vapor IX was presented, it landed in three colourways, but most of the attention went to the Sunset/Volt, and Fireberry/Electric Green boots. This means the Metallic Platinum has been brushed slightly under the carpet, even though it is in our opinion one of the coolest colourways out there. It can naturally still manage to make a big appearance on the big scene, but until then we have to rely on Francesco Pisano, to show them off. 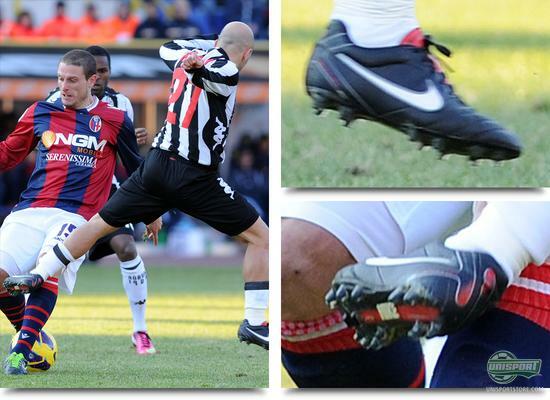 Alessandro Rosini (Siena)  Nike Tiempo Flight Black/Red It is very rare, that professionals settle for takedown models, but from time to time it happens, that we spot a star in one of the cheaper models. Alessandro Rosini has in any case chosen a pair of Nike Tiempo Flight Black/Red, that ranks just below the top model Legend IV. 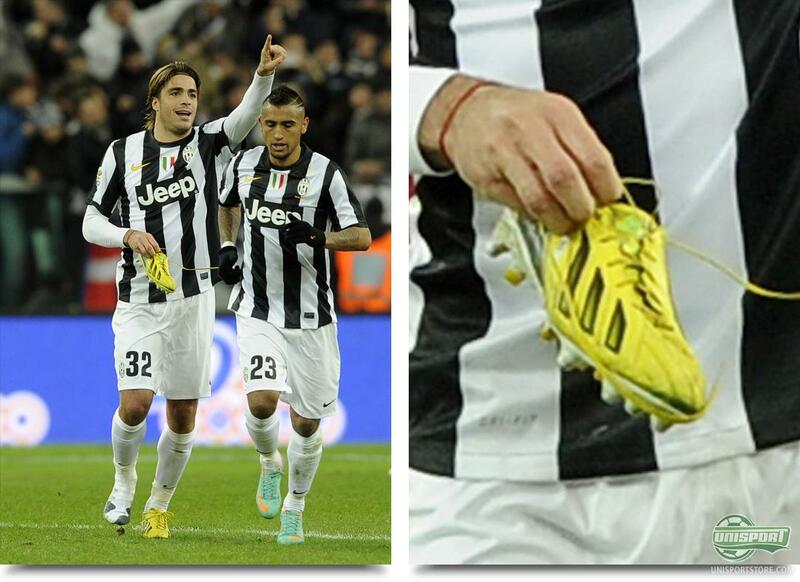 Alessandro Matri (Juventus)  Adidas F50 Adizero Yellow/Black When the Torino based club beat Fiorentina in the weekend, formerly mentioned Vucinic scored the one of the goals, and the second was delivered by Matri. It was quite a peculiar goal, because he lost his boot just before shooting and therefore scored in best Preben Elkjær style, bare foot. 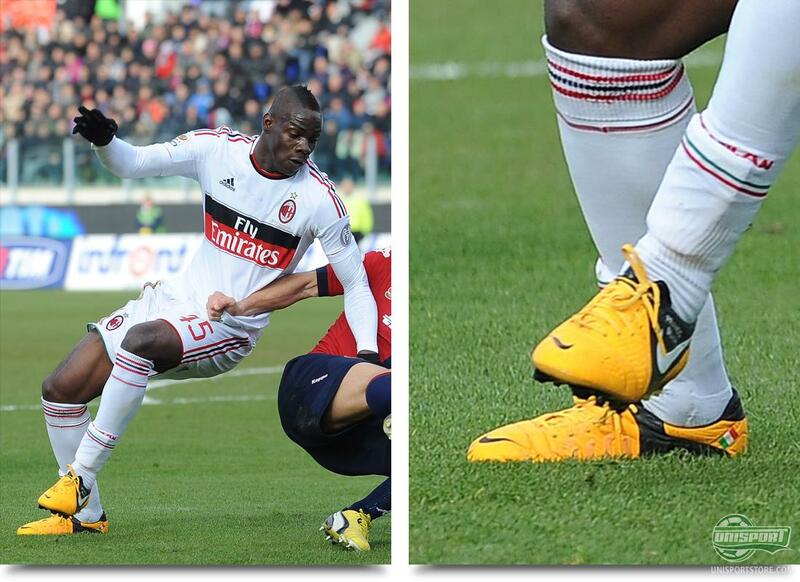 His Adidas F50 Adizero Yellow/Black were quickly put back on, but this still proves, that it's not the boot, but the player who determines skill. Mario Balotelli (AC Milan)  Nike CTR360 Maestri III ACC Citrus/White/Black The Italian striker has been stubbornly keeping a hold of the launch colour of the Nike CTR360 Maestri III, but now, he has finally switched them out. Fair enough it wont take too much getting used to aesthetically, because they are very similar, but none the less we are very pleased with the Citrus coloured Maestri III. Balotelli scored again, against Cagliari, and brings his goal harvest up to three goals in two games. Alexander Meier (Frankfurt)  Puma Evospeed 1 Graphic Yellow/Red/Blue If there ever was a place, that we didn't expect to spot Radamel Falcaos Puma Evospeed 1 Graphic Yellow/Red/Blue, then it would have been the Bundesliga. 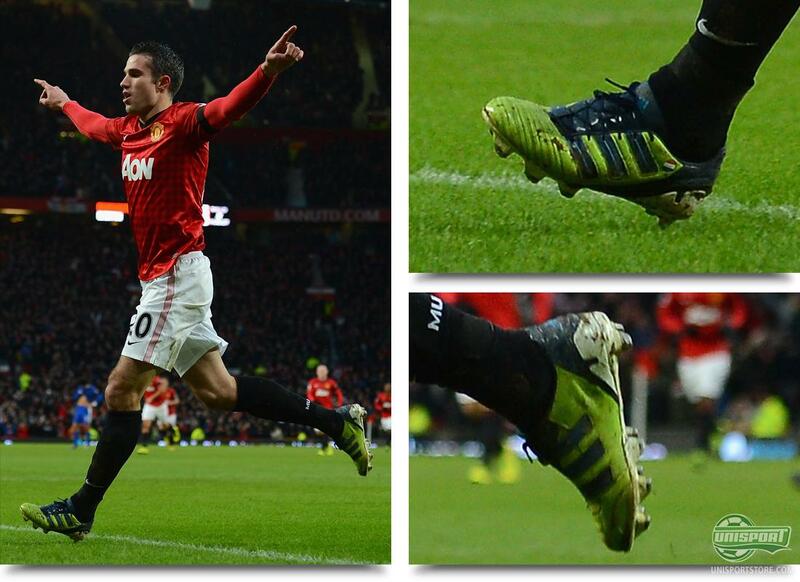 None the less, it was this pair of boot, that Alexander Meier had chosen, and they really look stunning on the pitch. As a bonus piece of information, you can also see the second generation of Adidas F50 Adizero Neon/Purple/Red in the picture. 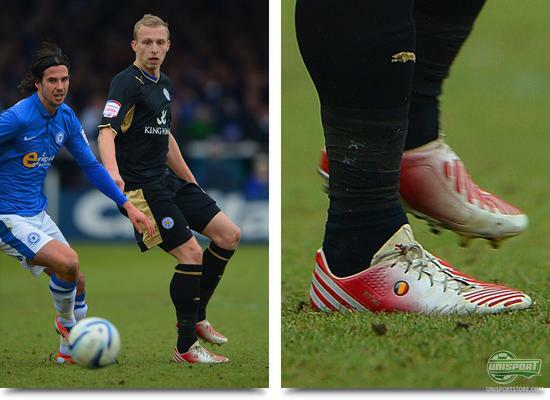 Ritchie de Laat (Leicester City)  Adidas Predator LZ miAdidas White/Red You can always count on the lower leagues in England to bring some awesome spots, and once again they deliver. Ritchie de Laat has before showed off a custom colourway, and back then it was a Adidas Adipure 11Pro, he chose. 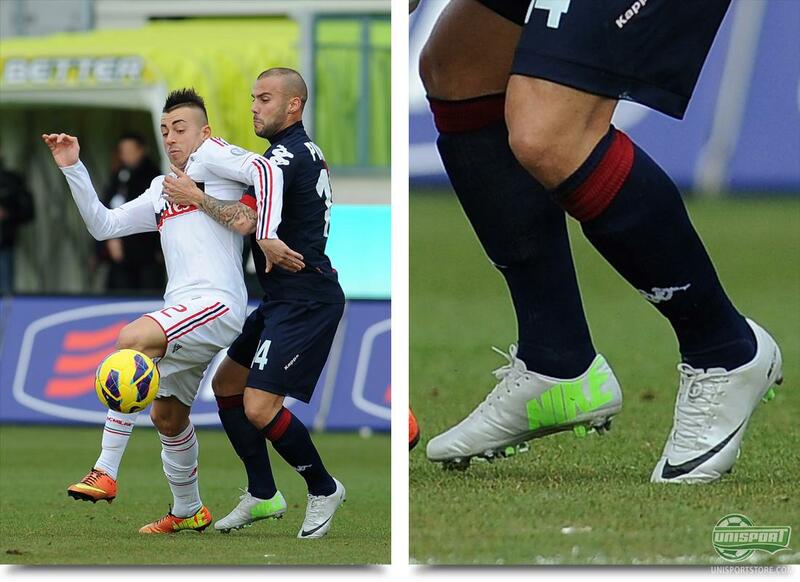 This time it was a pair of Adidas Predator LZ White/Red, which definitely deserve a thumbs up. Robin van Persie (Manchester United)  Adidas AdiPower Predator Slime custom The Dutch Premier League top scorer featured for his country in the midweeks game, and there he flirted with a pair of Adidas F50 Adizero, but when he returned to his club, he had once again turned to his trusted Adidas AdiPower Predator Slime/Blue. Unsurprisingly Van Persie scored again, and had he been just a little sharper, he might have gotten a hattrick against Everton. 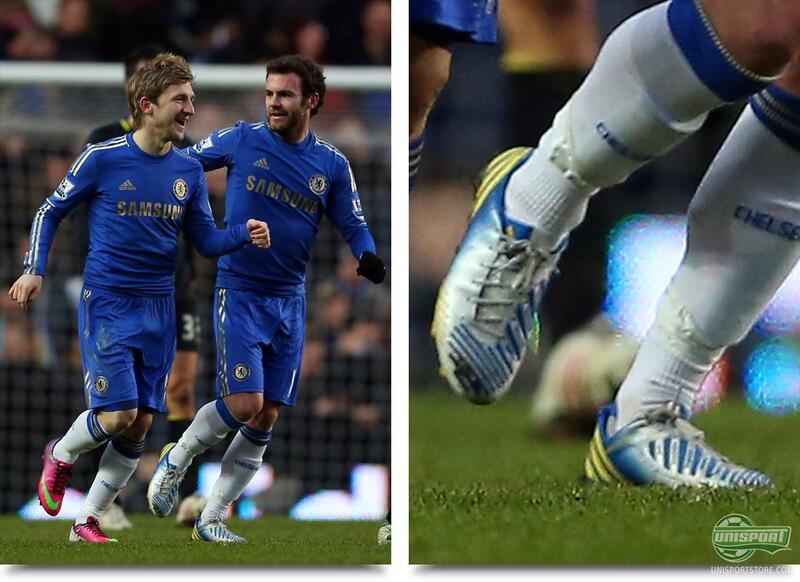 Juan Mata (Chelsea)  Adidas Predator LZ White/Blue/Yellow The Spanish attacking ace, has like RVP been trying out new boots in the international break, but he has unlike the Flying Dutchman, not turned back to his Nike Mercurial Vapor IX. He instead continues in Adidas Predator LZ White/Blue/Yellow, and if the switch sticks, the Germans from Adidas have really hit the jackpot. Mata has been in flying form this season, and will definitely be an excellent addition to the Predator-collection. 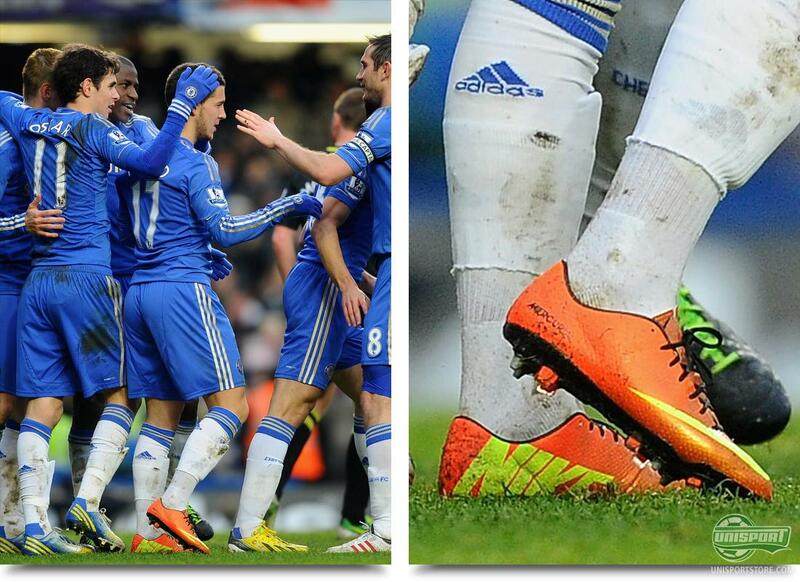 Eden Hazard (Chelsea)  Nike Mercurial Vapor IX ACC Sunset/Volt/Total Crimson It would take a lot of convincing to get the Belgian mega talent to pension his Nike GS2 ACC White/Black. He was one the few on the #GS2SQUAD, that actually played in the boot on a regular basis, and it actually seemed like he wasn't ever going to change them. He has now finally done so, and instead he has gone for a pair of Nike Mercurial Vapor IX ACC Sunset/Volt/Total Crimson. They got off to a good start, as Hazard scored a goal against Wigan. Fernando Torres (Chelsea)  Adidas Predator LZ White/Blue/Yellow The Spanish striker followed in the footsteps of his compatriot and team mate Juan Mata, when he took us all by surprise, and trooped up to the game against Wigan, in a pair of Adidas Predator LZ White/Blue/Yellow. If Adidas have managed to knick two Nike stars this big, you just have to tip your hat in recognition their way. Maybe the change of boot can kick start Torres' goalscoring? Danny Graham (Sunderland)  Warrior Sports Skreamer Pro K-lite Blackout American Warrior have made a very positive march onto the Premier League scene, where they have gotten several big stars in a short space of time. 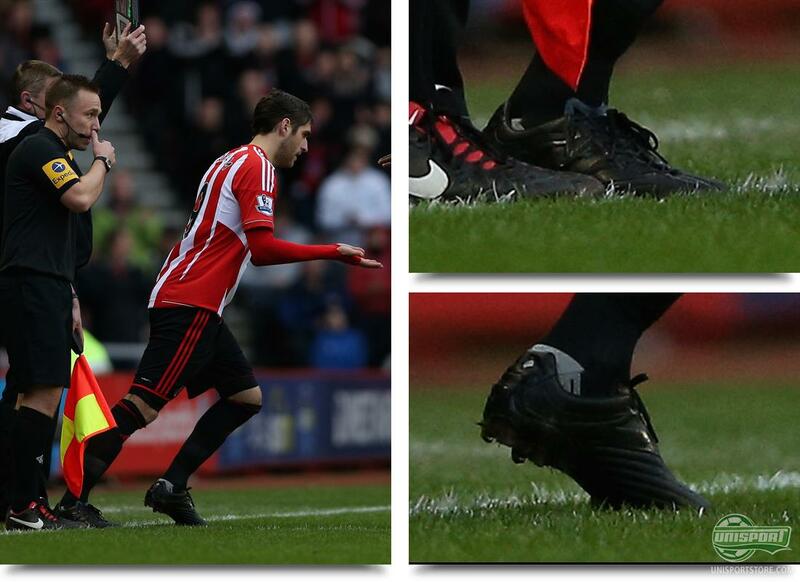 Fellaini, Kompany and Gutierrez are already playing in the boots, and now it looks like, that Danny Graham will be next. He played in the weekend with a pair of blackouted Skreamer Pro K-lite and gave his Nike CTR360 Maestri III a breather. 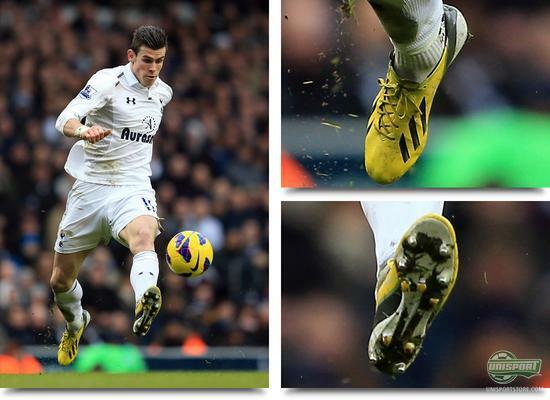 Gareth Bale (Tottenham)  Adidas F50 Adizero Yellow/Black custom The Welshmans form is really picking up the pace, who has already made this season his most scoring. In the weekend he again stole the show, when he with his two goals secured the win against Newcastle. He did so with his Adidas F50 Adizero Yellow/Black, but if you look underneath the sole, you can see, that they are not like the regular Adizero. They have not had space for the miCoach, and this must be a piece of technology, that Bale doesn't care much for. I would however be interesting to find out, just how fast the seemingly limitless man is. A comprehensive round of boot spots this week, where a great number of stars changed boots left, right, and centre. Which of the many boot changes do you see as the most surprising? Which spot do you think is the best? Share your comment in the box down below.